Beaded Kumihimo Love Knot bracelet made with size 8 Rose Gold and silver lined crystal Toho beads, artistic silver toned end caps and silver plate toggle clasp. 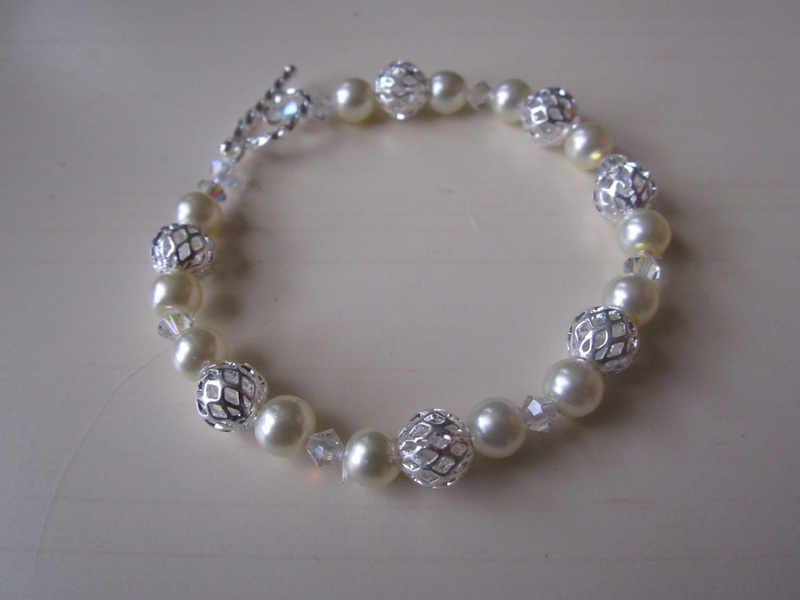 Crystazzi Pearls and Crystals and Shambala Rhinestone Beads add to the beauty of this updated Chelsea’s Choice. 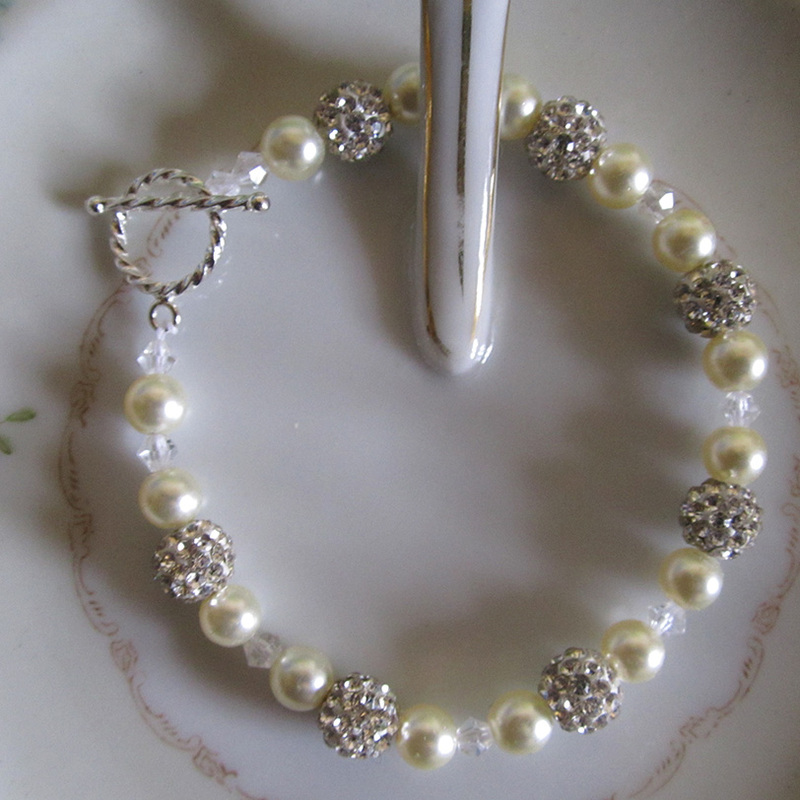 Made with Crystazzi Pearls, Swarovski crystals and silver seed beads, this is an elegant bracelet perfect for her special day. 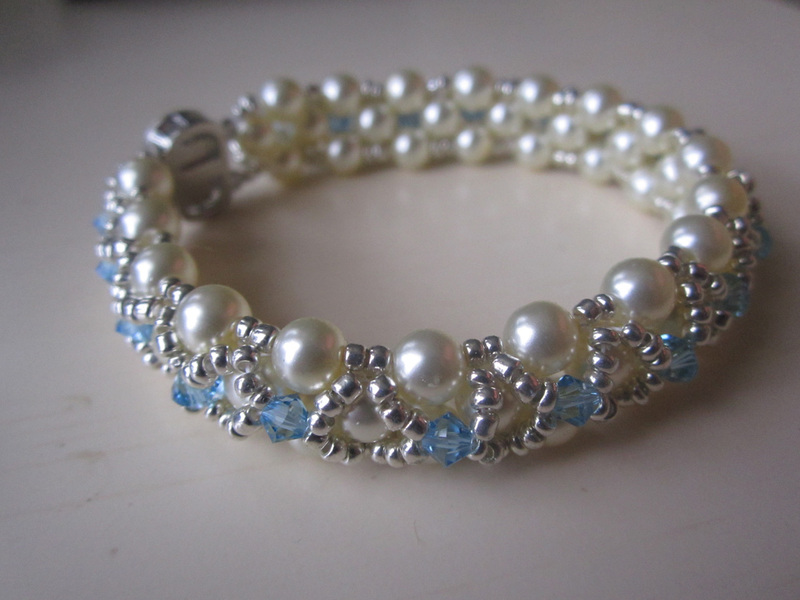 Crystazzi glass pearls, Swarovski crystals and silver tone open weave beads make up this simple, yet elegant bracelet. 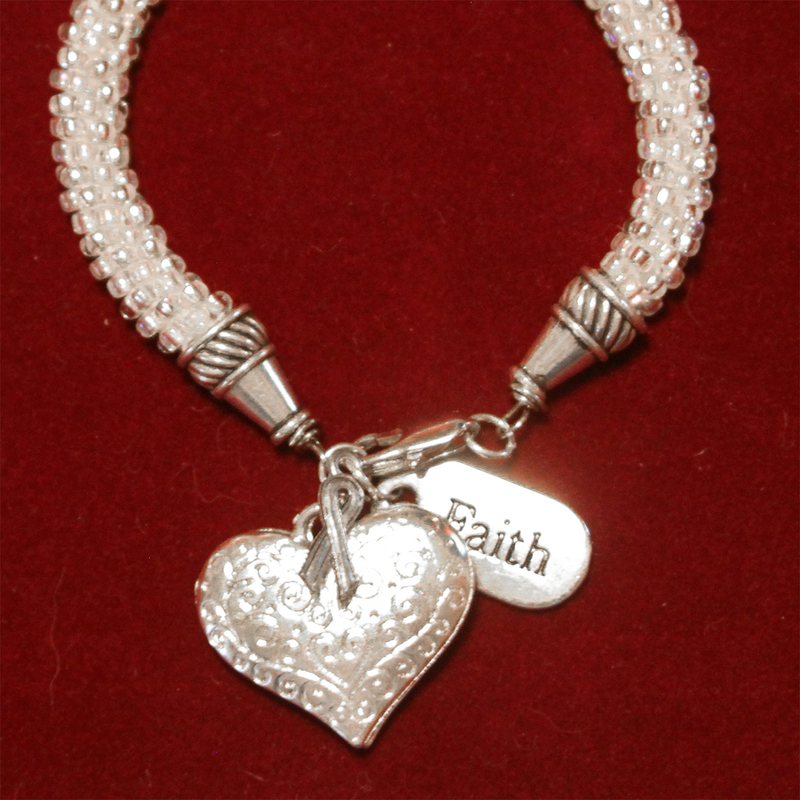 Of the three bracelets I gave to my soon-to-be daughter-in-law for her birthday, she chose this one as her favorite. After many years of dating, my son and his girlfriend are finally getting married. 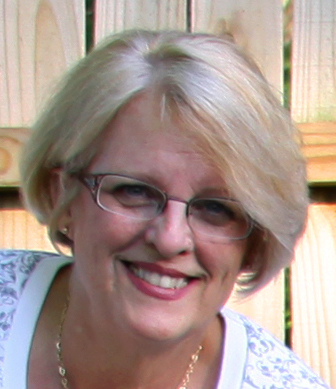 My soon to be daughter-in-law, Chelsea, has honored me not only with accepting me as her mother-in-law, she is wearing the wedding veil my mother made for me over forty years ago AND she is allowing me to make her a bracelet to wear at the wedding. 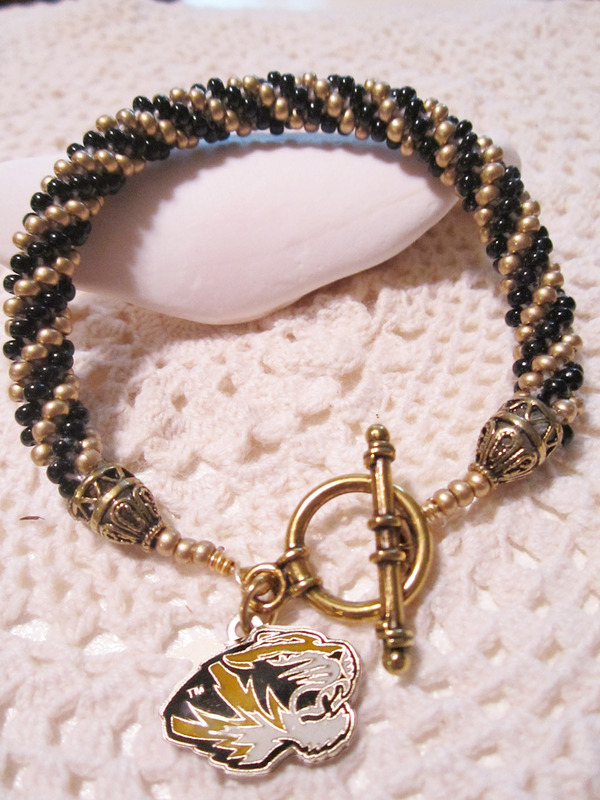 I found three bracelets that I thought she would like, so instead of asking her to choose, I decided to make all three. To night is her birthday dinner, so I am going to present all three of them to her. 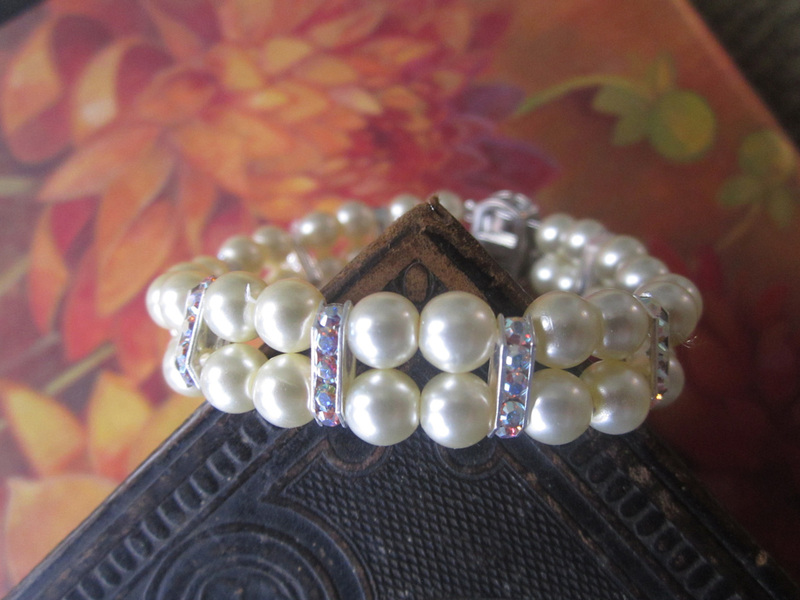 My favorite is this one I have aptly named Mother of Groom Pearl Bracelet. 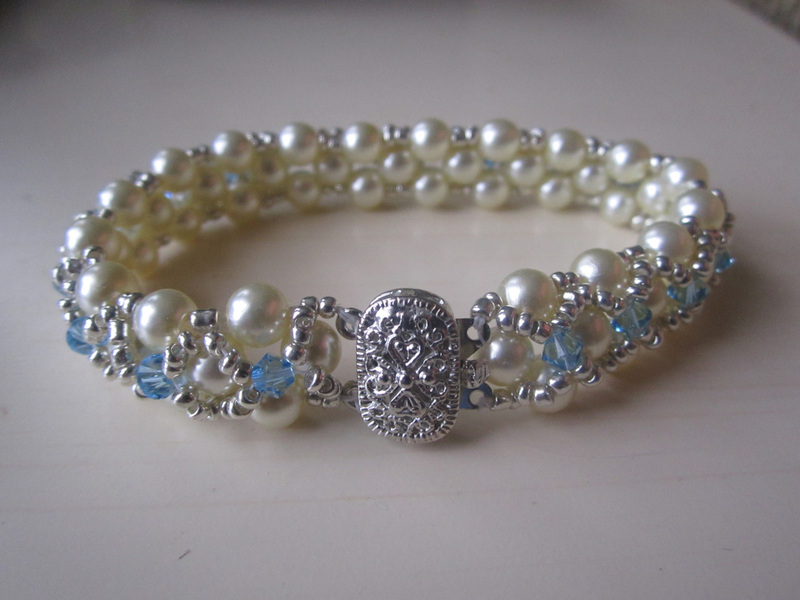 This is a very simple but eloquent design consists entirely of rhinestone spacers, pearls and a clasp. I used Beadalon Wildfire .15mm bead weaving thread to string the beads in an alternating pattern of two pearls then a spacer bar on both rows. 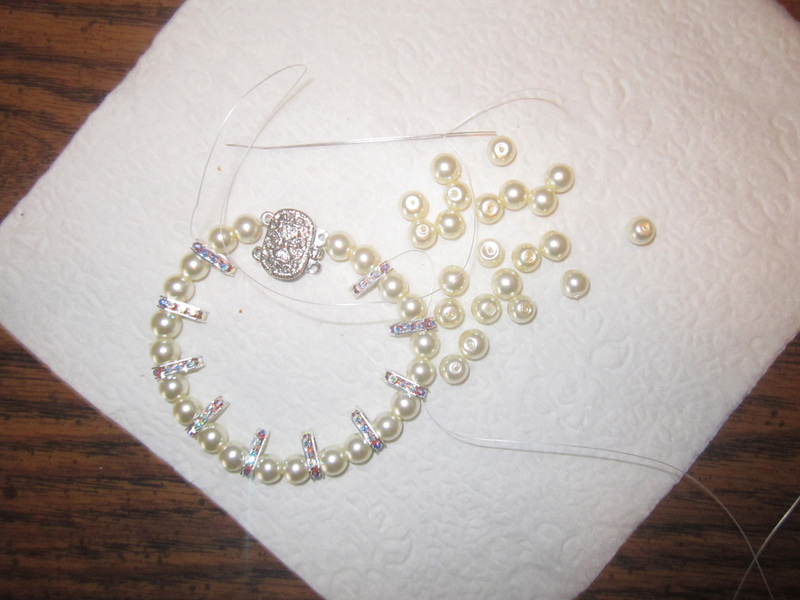 To complete this bracelet, you will need beading string, a needle ( I use large eye), a clasp, ten spacers and 44 pearls. 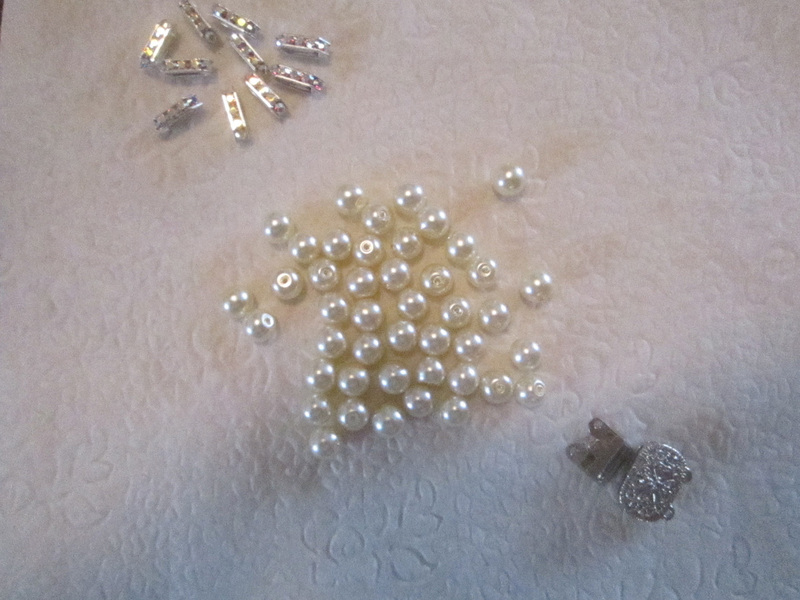 I used 6mm pearls, but really any type of pearl or crystal or bead will work. 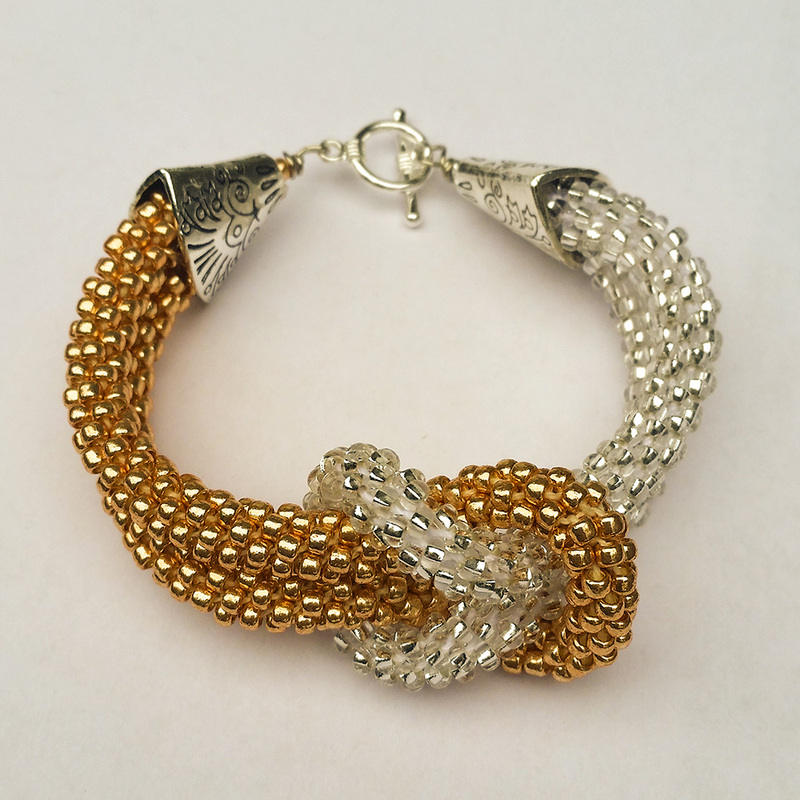 Here is a link to the other two bracelets: Chelsea’s Choice and Embellished Right Angle Weave Wedding Bracelet. 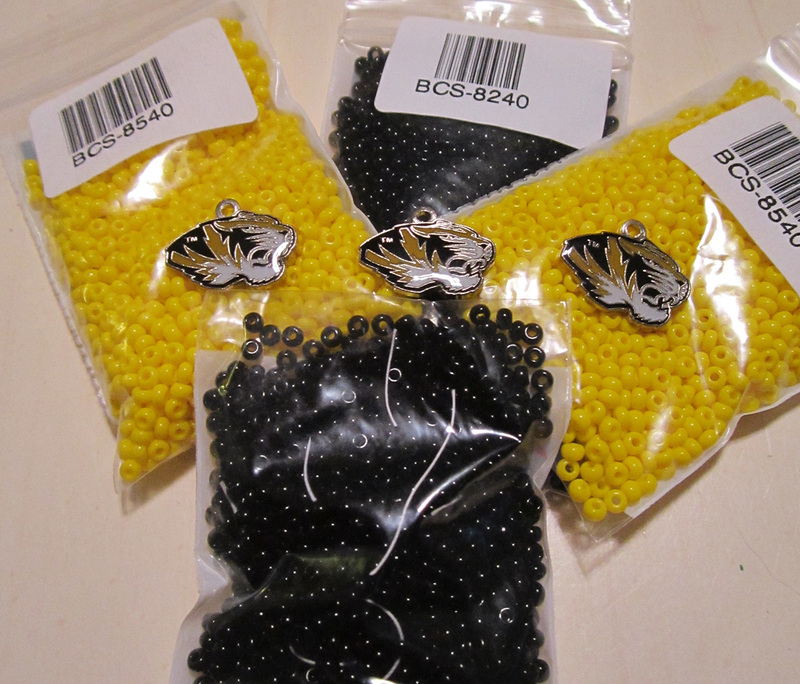 I’m going to start working on these beaded yellow and black Kumihimo bracelets for M-I-Z-Z-O-U as soon as I can. I’ve got the materials to make three. I’m not sure if I’m going to do them all in black and yellow spirals or if I am going to do one mostly yellow with a little black, one mostly black with a little yellow and one black and yellow spiral. I’m thinking maybe two spirals and one yellow with black. Hmmm. 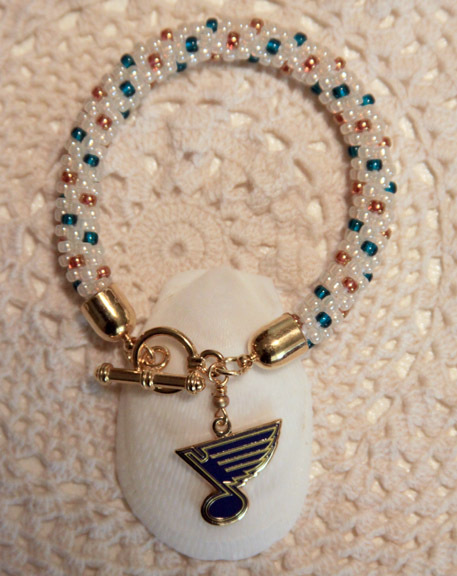 In honor of Chelsea’s birthday, and her love of the St. Louis Blues, I made this bracelet for her. 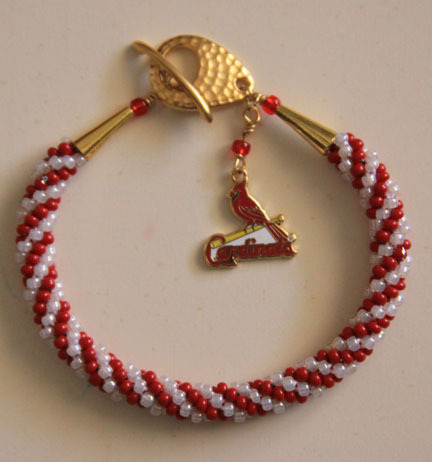 Eight strand Kumihimo braid with size 8 Toho beads, gold-tone bullet finding and a licensed St. Louis Blues charm.